Reading all the posts elsewhere I am genuinely surprised at the level of positivity. It's not often to see that from England fans. A lot of people are suggesting this team is something special. I'm sorry, but they clearly watched something different to me. It was a solid team at best. They haven't done anything close to what people are suggesting. I do personally think that players need to leave England and learn new things. All the players playing in the same league doesn't help. England and even us up here is Scotland have had a list of good young players who come through, but hit the barrier and never seem to progress any further. Why is there the confidence that this team will do any better? Some of the guys are quite young, but they are all experienced players with lots of games and caps under their belt. According to his Wiki page Alli already has 29 caps. Alli didn't have a good World Cup, but I don't think he's been as good this season than last. Rashford needs to get out of Man Utd as his progress will be hindered there under Mourihno. Reading the comments were build the team around Trippier, Maguire, Walker, Kane, Stones and Lingard. There is a good few players and Kane is a quality player. However I can't say that I've been that impressed with Stones or Lingard at any time. Both have flashes of good play, but not consistently enough and I don't see them being top quality players. Trippier and Walker are older than I thought. Trippier will be 28 soon and Walker is already 28. The entire team isn't as young as I thought. You don't keep hearing the young France team when they've got a 19 year old as their main player. Getting to the semi is a decent result. It's still not amazing when you consider how big a footballing nation England is with tons of money, and the teams England beat. I agree with you, Kerr boy - way too much Tottenham in that team ,anyway. It was only ever going one way. Not taking a creative midfielder to a WC was another one of Sadgate’s biggest mistakes. Wilshire and Lallana would’ve been better served in that squad than Dier. To be fair, Lallana needed plenty more game time to get fit and it would have been a mistake to take him to the world cup. Bang on - said that before a ball was even kicked - I’d add , Shelvey to that list^. So obvious we had no midfield creativity. Shelvey is a good shout! An unfit Lallana is a far better option than a fit Dier. Here's a stat to highlight the lack of creativity. 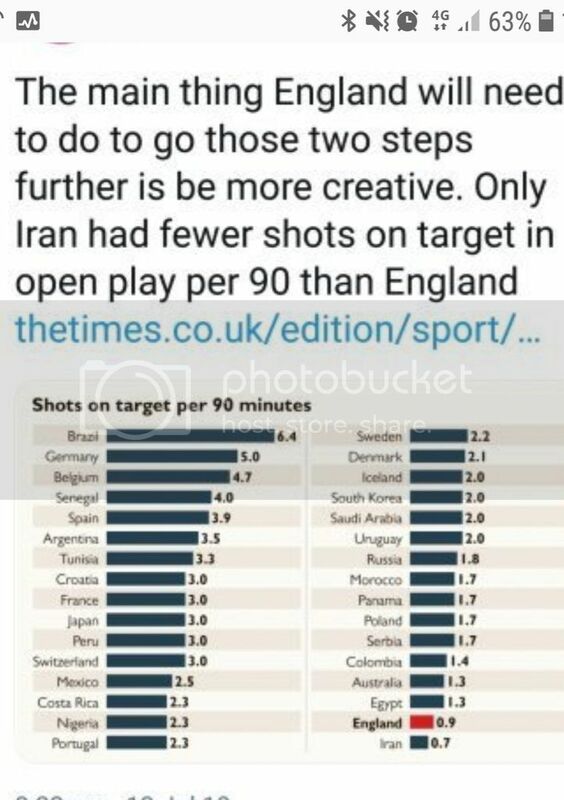 Out of all the teams at the world cup only Iran averaged less efforts on goal from open play. England averaged less than 0.9 shots on target per game. Last edited by bigmac3161; 13-07-2018 at 08:34 PM. So, we only finished up coming 4th at the world cup. Let's face it most England fans would have taken that before the tournament kicked off. Let's not forget this is a team in progress and we have multiple winners of youth competitions at euro and world level coming through. Having not been up-to-date with football in the UK for the last couple of decades due to living abroad and being used to the repeated disappointment from the England squad, I must say I was pleasantly surprised by this team, especially during the first half of most of their games, with good one-touch football running rings around other, more experienced teams, although they never seemed able to build on their advantage and mostly faded away in the second half, letting the opposition gain the upper hand, well except for the last game against Belgium, where they just looked worn-out and very mediocre. However, as it is a young team and a new manager, I reckon they have done very well and will be a force to be reckoned with the next time around: we might even make 3rd place! We were ok. Nothing more. Too much tippy tapping about for my liking. A more direct style should have been employed imo especially when time is running short. All well and good being patient and trying to work an opening, but when that didn't work there didn't seem to be a plan B. Most of the time, the patient approach yielded sod all anyway! Well, apart from Panama. Where we should have scored hatfull no matter how we played. Also a mistake/over confidence lead to them scoring. The less said of that lark of playing it short to a fullback back near our own area, then playing it backwards and forwards the better, half the time ending back at the keeper putting him under pressure. That's just inviting trouble! It wasn't just us doing it, the quicker that goes away the better. I just hope the Grimsby Town team don't think it's a good idea..
As for a young team? Same average age as the French, and they won it. There is just obviously less quality in our squad. Last edited by PugIain; 17-07-2018 at 06:26 PM.